upper deck and lower saloon windows (see below). The late ‘fifties were difficult times for Britain’s bus companies. Rising wages, increasing car ownership and declining passenger numbers made for a difficult trading environment; reflecting the downward trend nationally, in 1957 SWT reported a loss of 500,000 passengers compared with the previous year. 1956 had been the year of the Suez crisis bringing with it steeply rising oil prices and fuel rationing. The company had found it necessary to curtail some services. 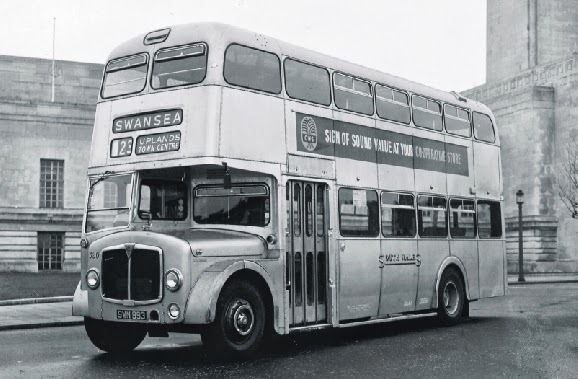 Cutting costs became the order of the day and a number of bus companies, including SWT, experimented with unpainted vehicles; Swansea’s famous ‘silver buses’ were born. 530 posed outside Swansea Guildhall. The first six were part of the 1958 intake of twenty six Weymann bodied AEC Regent Vs. Coincidentally, these were the first front entrance double deckers in the SWT fleet. They certainly looked impressive when brand new, with their polished aluminium exteriors reflecting the sunlight! 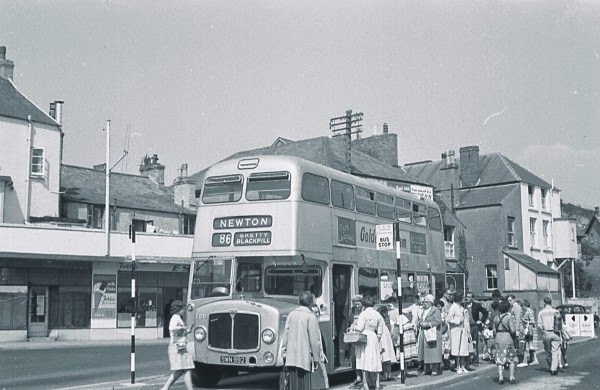 A further seven almost identical buses were added to the fleet in 1959 and all were to be seen on routes throughout Swansea, working from Ravenhill and Brunswick Street depots. Similar experiments were carried elsewhere, most notably at Liverpool and even London Transport ran one of its famous Routemasters in unpainted condition for a while. through the wash at Brunswick St. depot. In the long term, the silver buses proved to be a false economy. While the unpainted vehicles offered certain cost advantages at the time of delivery, ongoing cleaning and maintenance costs were often higher. This was because small dents and scrapes which, on a red bus could simply be filled and painted, on an unpainted one involved totally replacing one or more body panels. A bus which had received several repairs would take on a patchwork appearance! 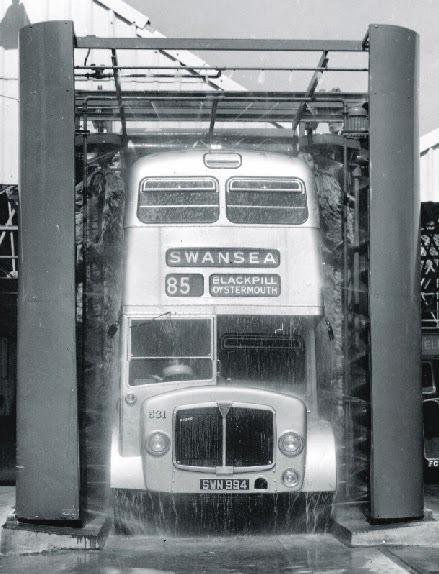 Swansea’s sea air was in fact a good test for the vehicles and the only severe long term corrosion was in the steel canopy above the bonnet which was treated with silver cellulose paint. Most alarmingly there was an unexpected safety hazard; in certain lighting conditions, presumably associated with foggy weather, the unpainted buses would be difficult to see. on its way to Newton on half hourly service 86. A busy scene at Oystermouth as 529 loads up with passengers for Newton. 531 (SWN 994) at Caswell Bay terminus. Services were later extended to a terminus in Caswell Bay car park, nearer the beach. 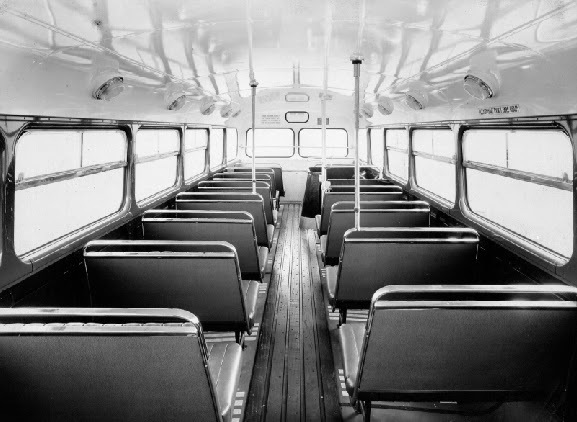 In 1961 it was estimated that the cost saving was only about £300 per bus, spread over the 10-12 year life of the vehicle. 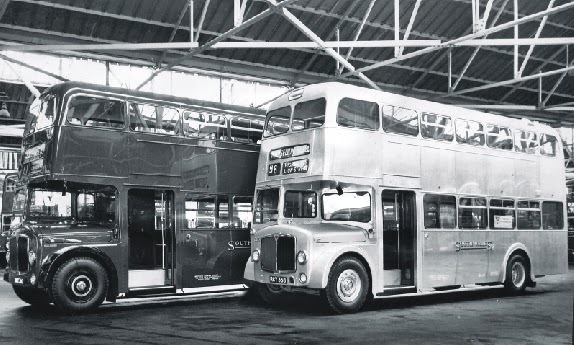 By 1966 the buses were looking more than a little shabby and as overhauls became due, all thirteen silver Regents were consigned to the paint shop to receive a coat of red paint. The buses remained in the SWT fleet until 1970-71, after which some found further service with smaller operators, including Eynons of Trimsaran who used one of them on their Llanelli to Carmarthen service. 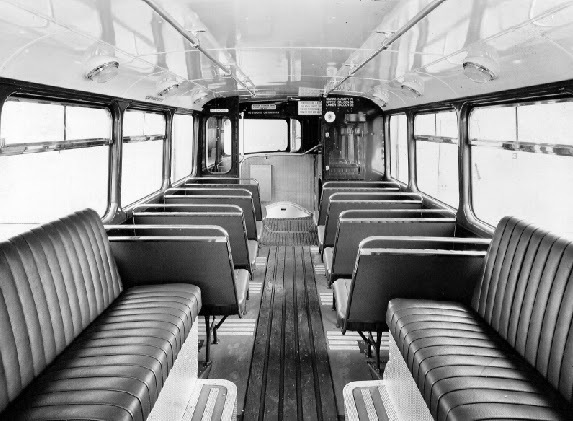 Upper and lower deck interior detail of the 1958 AEC Regents.